Heat canola oil in a large cast iron or non-stick skillet to medium-high heat. Add bell peppers and saute 1-2 minutes. Add garlic and saute an additional 30 seconds. Add black beans, sweet potatoes, chili powder, cumin and a pinch of salt and pepper. Cook 2-3 minutes, stirring occasionally, until beans and sweet potatoes are hot. 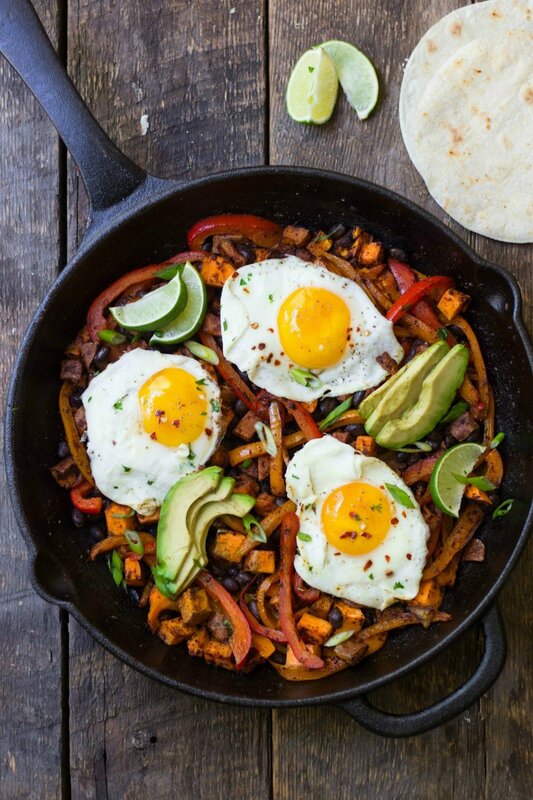 Scoop hash onto 4 dinner plates. Heat skillet again to medium heat and coat with cooking spray. Crack eggs into the plate and season with a pinch of salt and pepper. Allow to cook until white starts to set, about 2 minutes. Turn skillet to low heat and cover with a lid. Cook an additional minute, just until the white is set on top but yolk is runny. Place cooked eggs on plated hash. Garnish with avocado, lime wedges and scallions and serve with toasted corn tortillas.